The world was waiting with baited breathe for Meghan to arrive so we could see "the dress". No doubt she wowed in a demure slash neck and long sleeved gown. Graceful and elegant with the right amount of class; perfect for a royal wedding. Her veil stole the show for me - it was just the most radiant accessory and really completed the fairytale. So, we know that Markle brought her sparkle and slayed aisle style from here to Windsor and back. But what about the star-studded 'A-guest-list'? From Victoria Beckham to Serena Williams, yesterday's celebrations were really a who's who of celeb royalty, both homegrown and from across the pond. We have rounded up our favourite 20 gowns and encourage you to share your thoughts on your faves! 1) Amal Clooney - mustard is not for every girl but this Lebanese beauty look every inch a superstar. George who? 2) Oprah Winfrey - the soft pink looked fab against her beautiful skin and her 'boobage' was on fire! Top points to the Stella McCartney team for making Winfrey's dress the night before. She realised that her previous choice beige dress would photograph white - avoided a faux pas there. Up top Oprah! 3) Kate Middleton - luscious in lemon, this gorgeous gal has worn this outfit three times now and we LOVE her for it. Why waste a perfectly good outfit by never wearing it again? Also, why try to upstage the bride with a new outfit? Middleton is pure class from head to toe. 4) Priyanka Chopra - Markle's long time BFF and fellow actress looked fit for high-tea with Liz as she slinked into the grounds of Windsor in a lavender skirt-suit and matching hat. 5) Victoria Beckham - Elegant in long sleeves and classy in navy. Posh spice was a vision. We LOVE the red heels too - that's what I really really want! 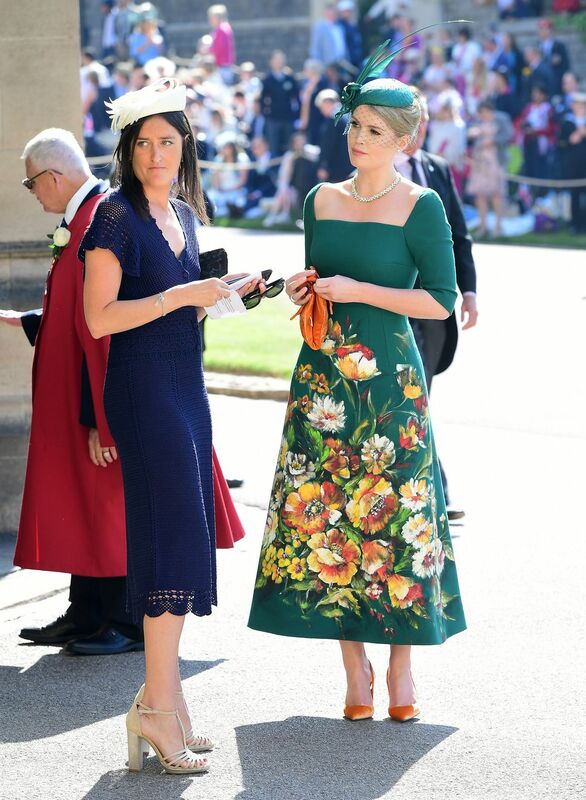 6) Lady Kitty Spencer - a gorgeous forest green corseted dress by Dolce & Gabbana was favoured by Princess Diana's niece. Bold in colour and season appropriate with the pop of colour flowers. J'adore the matching birdcage veil! 7) Autumn Phillips - Autumn donned a beautiful blue over the knee dress that was belted to show her trim waist. We love the collar to add a certain level of sophistication and etiquette and the off-kilter hat is just adorable! 8) Chelsy Davy - navy is definitely this bombshells colour and the gorgeous peplum detail added so much femininity and playfulness to her dress. Another of Harry's ex-flames in attendance to wish her old beau well! 10) Pippa Middleton - conservative yet completely elegant. Neutral pastel colours with some added swish and flare in the bottom of Pip's dress was the perfect understated yet pretty way to dress for the season and the occasion. 12) Sophie, Countess of Wessex - structured, patterned and in a beautiful ethereal shade of blue. I love this sophisticated and mature look. Perfect for a royal affair. 13) Sarah Rafferty - another navy gown, this time by Lanvin. Loving the addition of the statement sleeves to add a little more drama...just in case there wasn't enough! Another birdcage veil and seemingly a popular style for the occasion. 14) Cressida Bonas - I absolutely adore this quirky and almost Andean style dress that Cressida wore to her ex-flame's nuptials. Quirky, colourful, bright and fitted in all the right places. 15) Abigail Spencer - she sashayed in with another actress on our best dressed list, Priyanka Chopra, in a gorgeous polka dot dress y Alessandra Rich. An OTT collar, cuffs and large buttons make this dress more playful and less conservative. Sophisticated yet playful and finished with a quintessential birdcage. 16) Samantha Cameron - 'Samcam' chose a bold kingfisher blue and chunky necklace to compliment her dark hair. I love the bold orange to contrast the overall look. 18) Troian Bellisario - a far cry from her beach wedding, Troian looked angelic in a beautiful pale pink gown with long sleeves. The modern choker neck was similar to Markle's evening gown and the signature flowers that were a huge feature this year are peppered along her shoulders. 19) Carole Middleton - An exquisite shade of aquamarine looked glorious with Caroles' complexion. The fluted shape of the jacket was flattering and perfect for Spring and we LOVE the matching accessories. We see where Kate get's her chic fashion sense from! 20) HRH Queen Elizabeth II - as usual making a statement in a soft neon yellow/green with pops of lavender, Queen Elizabeth makes herself stand out for the masses to identify her. Accessorising with pearls and a few feathers, she was fit for spring and the wedding of her rather gorgeous grandson. Well done Liz! Will you be bringing that Markle Sparkle to the aisle? Incorporate a little royalty into your attire and add your own signature style. See 2018/19 trends that hit the runway! Copyright Aster & Wilde Ltd.